I just got off the phone with Joseph Zambarano about a potential new project and he asked if I had seen the lounge at Fusebox Festival headquarters. I asked him to send me pictures immediately to post here since it is coming down on Sunday. Joe is an amazing artist, builder and craftsman and crafted the kitchen at Beverly Skyline. It sometimes took a day to set a cabinet as they are very precise and the work is impeccable. Joe also made the entry bench under the Roi James painting on River Road. "Splinter Group members, Mark Macek, Hawkeye Glenn and I where invited to provide a lounge for the Fusebox Festival Headquarters at the AMOA. The lounge will be coming down this Sunday. 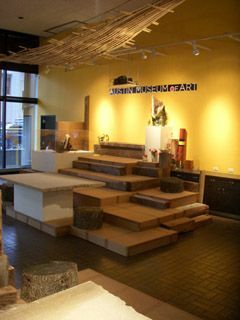 We used salvaged timbers, slabs of limestone, tree trunks, and cardboard wrapped theater flats to create a multilevel seating area, a box office desk and three tables of varying heights. 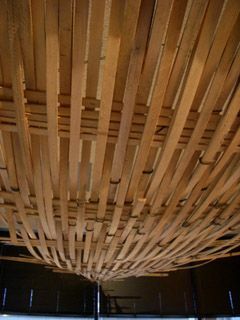 We also wove a cypress slat sculpture on the floor and hung it from the ceiling. 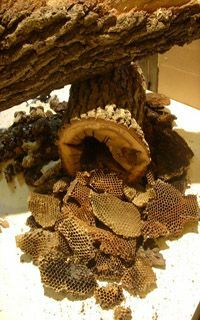 One of the fallen trees we used had a abandoned bee hive. During the festival the space is being used to inform the public about the involved artists, sell tickets to events, and hold public talks. There will be one more Fusebox Talks event this Saturday at 2pm with Cloud Eye Control. Waffles will be served. Check out the rest of the performance schedule at; fuseboxfestival.com"